Ikodomos Holding, a privately-held independent investment and asset management company, founded in 1989, holds today a leading position in Luxembourg's real estate development and investment market. From the very beginning, Ikodomos Holding has always carried out its planning by district. During the 1980s and 1990s, the company purchased large plots of land in strategic locations, developing some of them to create entire zones of retail and semi industral parks. 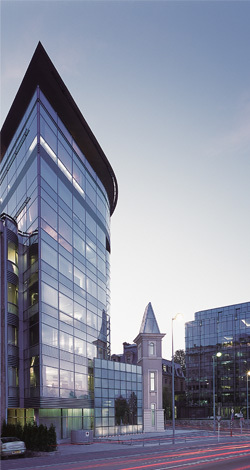 During the 1990s, the group also completed its first office building developments including landmark property 1 boulevard Royal in Luxembourg-City, dating from 1998. This prestigious building provided a springboard for a long series of developments in Luxembourg's main business districts. These developments include among others, Laccolith (2002), with its pioneering technology, and Atrium Business Park (2006 to 2011), the first office complex in Luxembourg with an integrated complementary service offering. Today, the holding develops mixed-use areas which combine residential, retail, service and office buildings with green spaces, through projects such as Eurocity at Luxembourg-City or Arboria at Differdange, having in-depth expertise in every aspect of the development process from planning and design to construction management. Ikodomos Holding has opted for an asset-based real estate strategy since its inception. Over the decades, it has constituted an impressive land bank allowing major projects in locations selected for their long-term development potential. Ikodomos Holding is more than a simple property development company. As an investor, owner and manager it benefits from a global view of the property value chain. Through the perspective which this generates, our teams make outstanding design choices which create long-term value. The group designs buildings which are more flexible, cheaper to operate and built to last. Ikodomos Holding's success in Luxembourg has brought it business opportunities further afield. In 2005, Ikodomos Holding invested in Slovakia through its subsidiary, Lucron Development. The following year, it invested in Slovakia through its subsidiary, Lucron Development. In 2010, Ikodomos delivered Hôtel de la Source, which overlooks the famous La Source hairpin at the Spa Francorchamps motor racing circuit in Belgium. Ikodomos Holding is perfectly positioned to enjoy strong growth and now covers, either directly or through ships, all segments of the property market including business, retail, residential and hospitality.